With a name like Efferman and a building style that makes grey rectangles look graceful, you'd be pardoned for thinking he might be a descendant of a certain engineer who gave his name to a famous Parisian landmark (and subsequent LEGO set). Michael Wirth, aka Efferman on the Eurobrick forums, is a prolific Technics builder, which he has enjoyed since he was a small boy in the 80s. His current main focus is industrial trucks and cranes, and with his professional background in heavy machinery and being surrounded by cranes, bulldozers and transporters all day it's no wonder his build trend is all about big rigs. Michael explains that when the first UCS Millennium Falcon (10179) was released in 2007 "was too expensive for me at his release" but when the recent incarnation came out he saved up and treated himself. 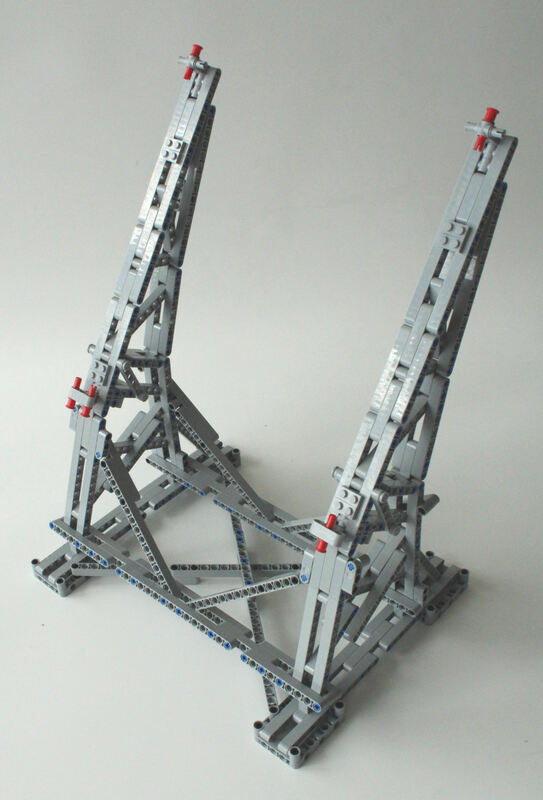 After completing the build he realised "it is a huge thing and hard to display without a special acrylic box or table", so he decided that to put his Technic design and building skill to good use. 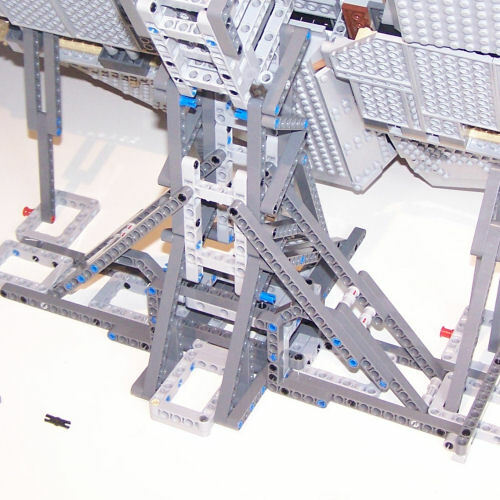 It only took Michael one prototype, which he built in the first instance, in brick form before he made a revision, settling on the one that we are looking at in this article. After sharing pics of his display stand on Eurobricks he got a lot of requests and so he translated his build to LEGO Digital Designer (LDD), a now defunct freeware computer program produced by the Lego to assist in designing and sharing creations. Not long after sharing his ldd file, he was contacted by Lucio Switch who - because LDD's auto-generated instructions aren't particularly easy to follow - wanted to create and share a proper set of instructions. With permission from Michael he published, through Rebrickable.com, a downloadable PDF that looked, for all intents and purposes, like an official publication. Once the design was on Rebrickable the stand went viral. Given its success, Rebelscum wanted to know why Michael never charged for the instructions. "There was never a thought about to make money with the stand, and I am happy the people are Satisfied with it." Unfortunately whenever there is a LEGO success story there are those ready to capitalise on other people's efforts - and LEPIN promptly brought out a set. Unphased by his Michael states "there is no possibiiity to kick them in their megablocks." Aside from a brief dip into Technics in the early 80s, plus being the proud owner of a BMW R 1200 GSA set, I have pretty limited experience of dedicated Technic construction. If you're like me you needn't be put off because the build is simplicity in itself and Efferman's Vertical Stand will only take you a couple of hours to put together. 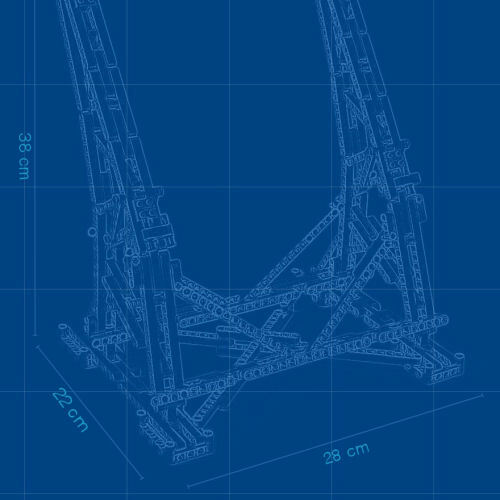 There's only one flaw in the design - it's noticeable in the instructions at step 13 because the software used to create the stand's manual deemed it an illegal connection, and it puts an uncharacteristic amount of strain on the frame. 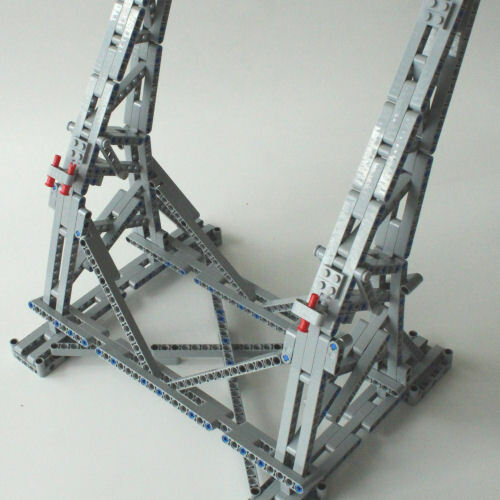 When assembling the stand it feels like the lift arms are going to snap under the force they are put under to make the connection. 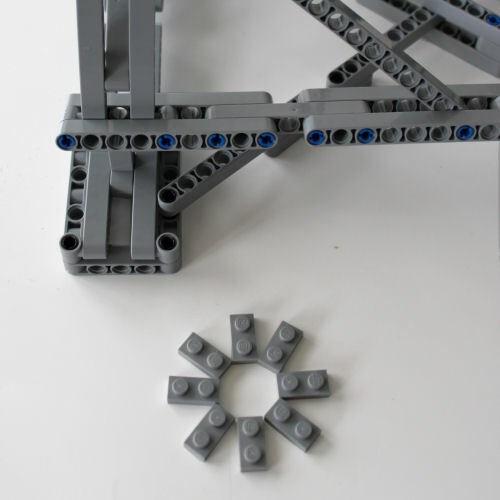 And though it seems there is some subtle curvature that probably leaves the designers at LEGO wincing, trust the design as it all settles outand you end up with a perfectly square and symmetrical stand. A couple of words of advice from someone who has put himself through the mounting process - get help. 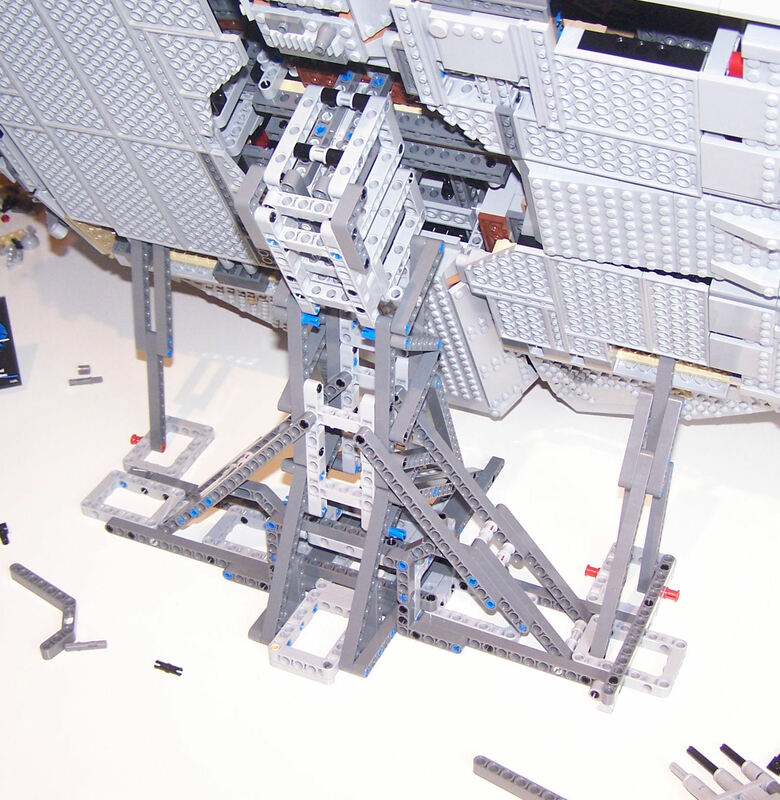 It definitely takes two people to perform the operation, from removing the landing legs, to positioning the UCS Millennium Falcon on the stand and supporting the weight while the pins are locked in place. Laying the stand flat, propped up by a stack of books, is probably the second-most important step to take. 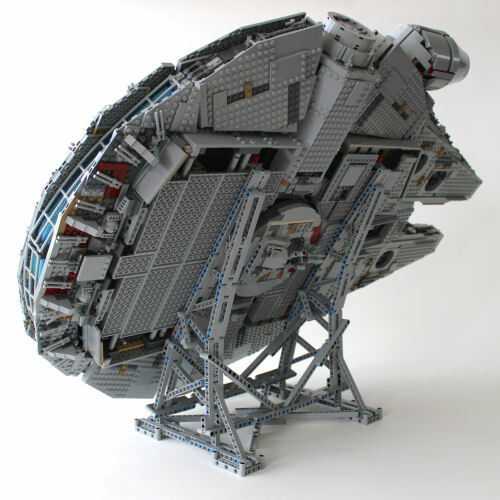 Efferman's own advice is to build the UCS Millennium Falcon onto the stand, rather than mount a completed build on it. He says that "hte perfect situation for mount is when the floor plates on the underside are assembled. After this there is easy access to the underside during building." During the mounting process it was noticed that the eight 2 x 4 light bluish grey plates were a hinderance and didn't contribute any significant security, so they were removed, and one of the red Technic friction pins was better positioned in the middle of the h-shaped liftarm. There are a number of tutorials, like the one below, available on Youtube to help if you want to have a virtual toolbox talk before you start. 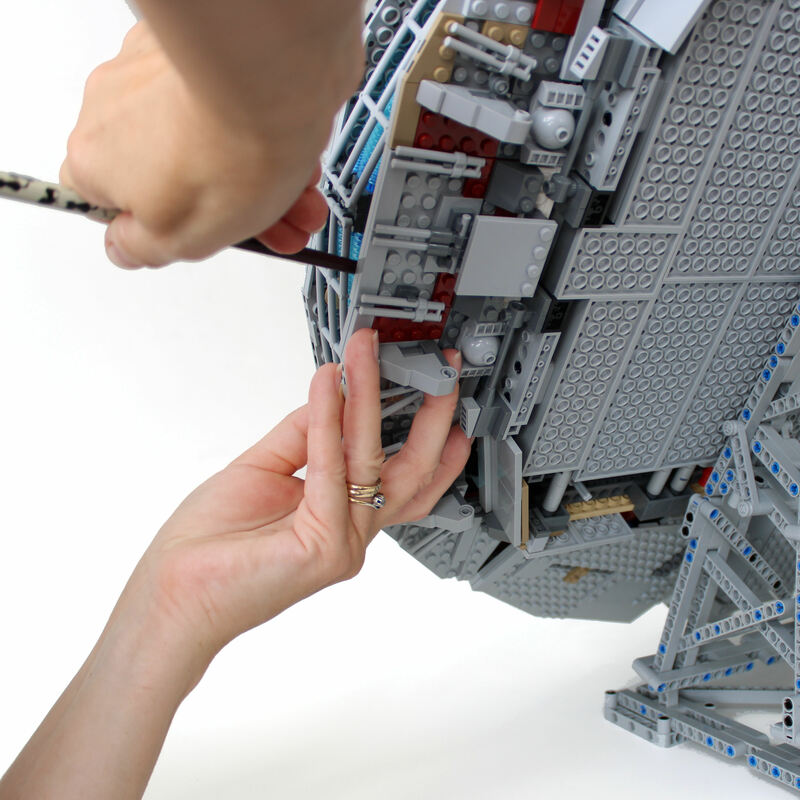 No matter how much advance groundwork you have done, the fitting is a bit of a struggle so be prepared to accept the reality that some re-assembly of the UCS Millennium Falcon will be required. Having the instructions to hand at the end of the build will take the stress out of any final touch-ups. The final result is elegant and simplistic, and is a work of art in itself. So much so that this unseen hero that makes the 75192 Millennium Falcon so displayable doesn't deserve to be tucked around the back. 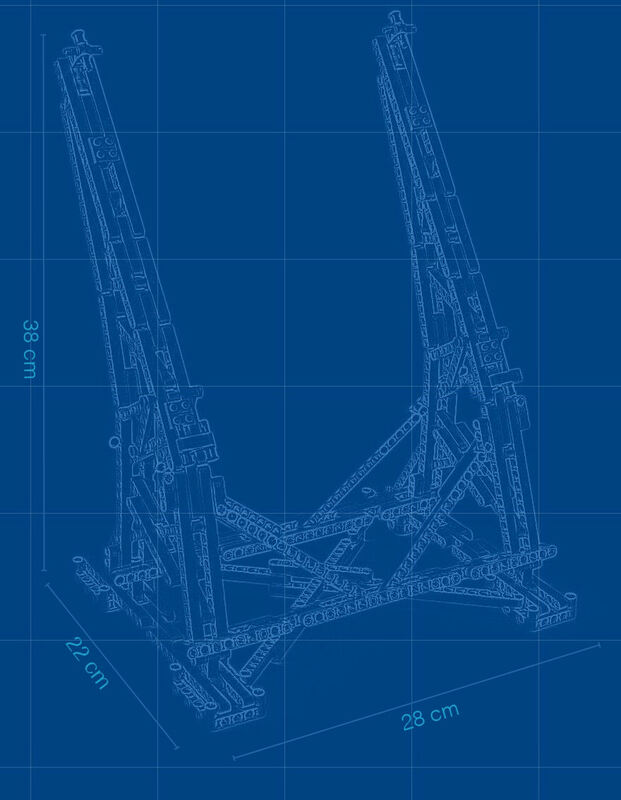 As a standalone construction the blue Technic pins do detract a little bit, but that's no fault of Efferman and because the stand is hidden, the blue pins aren't the least bit noticeable. 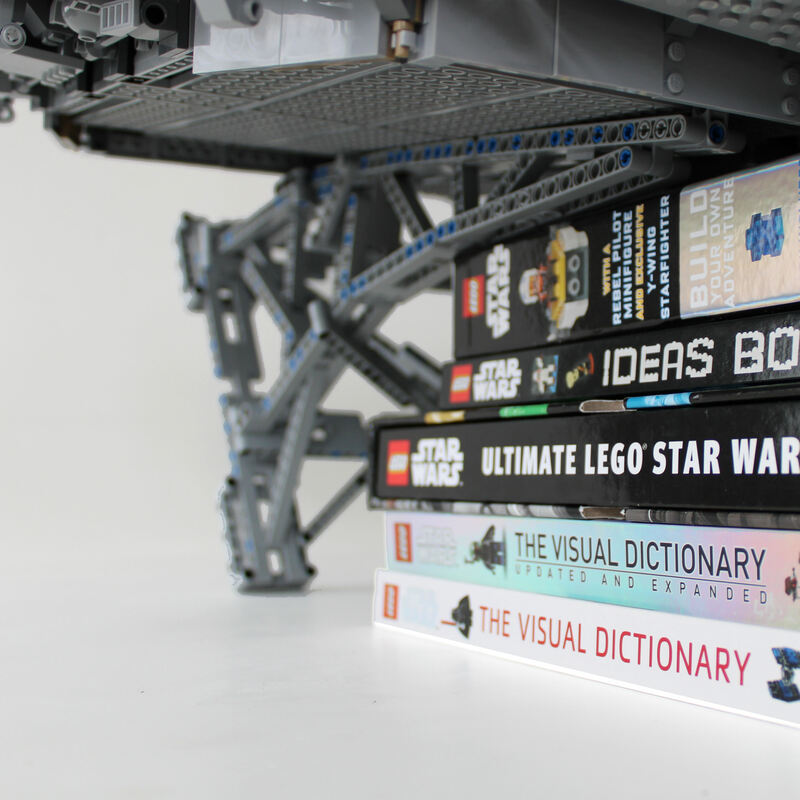 You have a number of options if you are ready to invest the time and money into building a display stand out of LEGO to display your LEGO. The most obvious being eBay where kits are available for around $80. Before you commit to the purchase make sure that the pieces are genuine LEGO as there are a number of sellers peddling compatible parts. 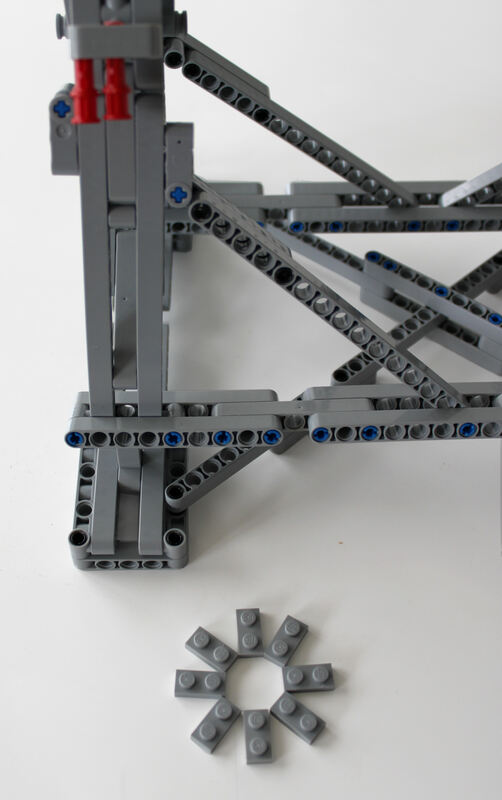 While the two are visually identical and you will be able to build the stand, the quality of the plastic LEGO uses is tested and guaranteed so you won't have to worry about any stress points forming under nearly 30 lbs (+10 kg) of load. Your second option is to buy the bricks yourself. Marketplaces like Bricklink and Brickowl are the places to go. Both have the ability to upload a parts inventory (also available on Rebrickable) of the 407 parts required directlyinto the site. This allows you to automatically search the thousands of sellers. Whilethis route takes a bit more effort, it is slightly cheaper and you are guaranteed to get geunine LEGO parts. Depending on how much time you are willing to spend hunting down sellers, you should expect to spend between $50 and $65 (plus postage). Unless you want a paper copy just stick to the free PDF download - you'll need a zoom function anyway - don't be tempted to buy the instructions because Rebrickable.com has it available for free. 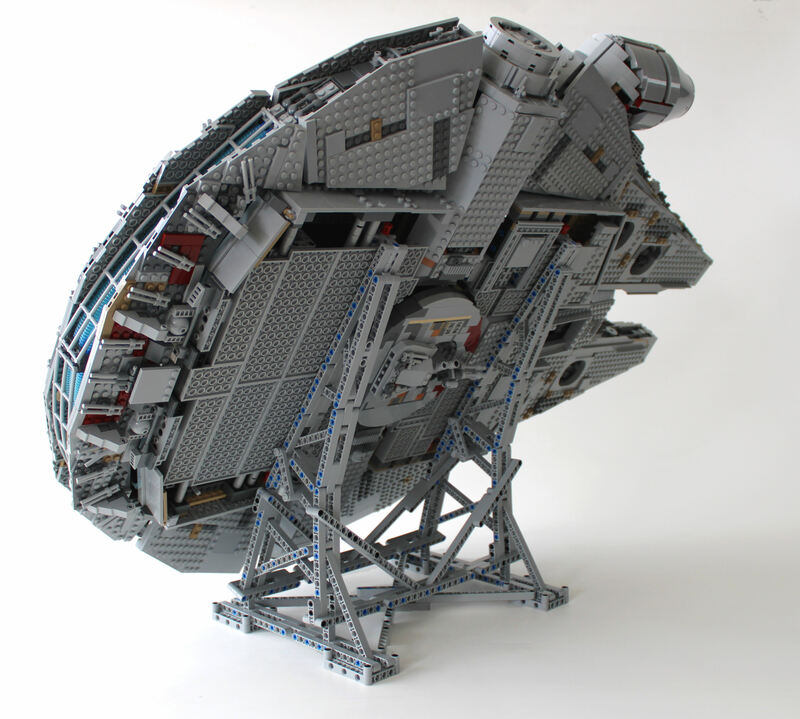 Rebelscum's final verdict is this is recommended as a must buy for any owner of 75192 Millennium Falcon and provides a great alternative to point your living room furniture at.